Psalm one introduces what Dietrich Bonhoeffer called “the Prayerbook of the Bible” and Martin Luther once called the “little Bible”. Here in these one hundred and fifty little (and occasionally long) poems and songs we encounter the breadth of emotion and dedication put into poetic form. Many scholars believe that Psalm 1 was added as a forward to the entire collection of Psalms and gives a summary of what is to lie ahead and the structure of the Psalm itself encourages this thought. The Psalm begins with the first letter of the Hebrew Alphabet with the word translated ‘Happy’ (‘aŝrê) and ends with the last word beginning with the last letter forming an inclusio, a device frequently seen in wisdom literature and denotes a completion of a thought or idea. So why write poetry about the law? Seems strange or foreign to us and why introduce the Psalms with a meditation on the law? 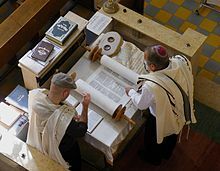 For many people poetry and rules are antithetical, but to a Hebrew way of life the law is at the center for their view of a life in harmony with God’s will. The simple dichotomy between the righteous and the unrighteous, the wicked and the law delighters may seem odd. This was a Psalm I never really enjoyed until recently because it seemed to pretentious, to easy to place oneself in the position of the righteous and not in the place of the wicked, but as an introduction to the Psalter and as a way of looking at the law not as something to be dreaded but something to delight in has changed my mind. It is not a coincidence that the Psalter begins with a meditation of the delight of the law and that the longest Psalm (Psalm 119) is a meditation on the law. That in knowing how one is to live, what it means to be in harmony with God’s will for the people and the world is joy. For the Hebrew people the law of the LORD is life and to ignore the way of the LORD is to undercut one’s own life. In a world of easy expedients that may bring short term prosperity the people are called to a way of life that is in harmony with the creator’s desire for the world. The word translated happy, probably is better translated ‘blessed’ (this Hebrew word would be translated into Greek Septuagint (the Greek Translation of the Hebrew Scriptures) as markarios which is the first word of each of the beatitudes in Matthew 5) and in entering into the poetry and the struggle of the Psalmists (since there are multiple composers of the Psalms) it is also an entry into the meditation on how one is to live in the continual meditation on the law of the LORD. Poetry and wisdom, life and the law, the way of the righteous and the blessed may not be simple and it may be something that continues to be a dialogue between the LORD and the LORD’s people, but entering into the meditation of the law of the LORD may not be an invitation to prosperity but it is an invitation into a blessed life. This entry was posted in Psalms and tagged Blessed, Law, Psalm 1, Torah. Bookmark the permalink.